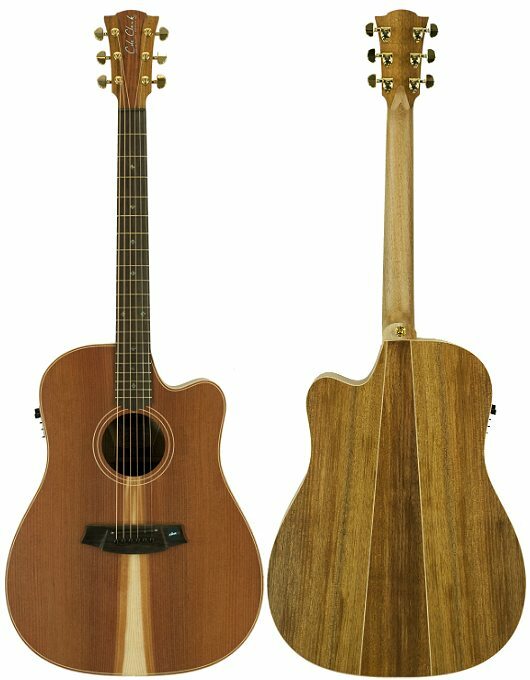 Founded in 2001, Cole Clark combines classical construction with innovative design and manufacturing techniques to produce a lighter, stronger, unique guitar with a natural amplified sound. Cole Clark steel string acoustic guitars are the only main stream acoustic to use a Spanish heel or integral neck construction. This means the neck is glued to the face along with the sides and the back so the neck is one piece all the way to the sound hole. On other guitars, the body is made then the neck attached, mostly with a bolt or dove tail join. Due to our method, the sound is unique. Cole Clark also has a carved top and back and uses a ridge system to join the sides to the top and back instead of kerfing. The Cole Clark patented pickup system is the most acoustic sounding pickup available. Aimed at finding a more natural tone when amplified and eliminating piezo ‘quack’, our pickups comprise different elements that only hear certain frequencies which they’re best equipped to handle. This is done using a combination of 6 loaded piezos under the saddle for bottom end, a face sensor that can be blended in to hear frequencies in the mid to high range (350hz maximum crossover) and a condenser microphone shelved to hear only extreme highs. Cole Clark guitars are all solid timber using mostly native Australian tone woods that are largely sustainable.